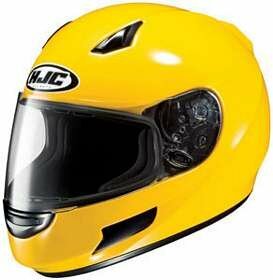 HJC has been the best-selling helmet brand in the US for years. I don't know if they will hold that title for 2009, but I would guess it likely, considering the quality they deliver for prices that make you nod. The cost of their helmets is not ridiculously, quality-questioningly good, but it is a pleasant surprise at the end of the feature list. The feature list for the full-face CL-SP includes a polycarbonate composite shell. These are popular due to the protection they provide while keeping the helmet light and easy on the neck. The shell construction has helped the CL-SP gain both Snell and DOT approval. The face shield offers 95 percent UV protection, anti-fog capabilities, and an anti-scratch coating. HJC's AccuSight shield on the CL-SP has great optics to boot. If HJC could throw another 5 percent on the UV protection, I would be sold. Locking down with a 2-stage mechanism, the shield creates a tight seal with the eye port gasket. This is excellent for reducing wind noise and keeping out the elements. The air should get in through the ventilation system, not around the shield. The lining of the CL-SP is anti-bacterial and moisture-wicking. Like most modern helmets, the lining is also removable and washable. HJC has outfitted this helmet with all of the basics and a few perks. You won't be in awe of a shell than can only be dented by a meteor crashing through the Earth's atmosphere, and you won't be floored by a price take that doesn't meet triple digits. You will get more than ought to come with such a price and a great selection of sizes and colors. Try this helmet with some AGV armored gloves for extra protection.